Hi, Good Morning. Thank you friends and viewers. Today I will post how to make Inguva Chaaru Recipe. Inguva or hing or asafoetida is the main ingredient in this dish. Asafoetida is a regular ingredient in most of the Indian vegetarian dishes, especially in chutneys, pickles, and in dishes which are made without onion and garlic. It has a pungent smell but when it is added to any dish, it gives a nice aroma to the dish. It is used as a digestive aid and flavour enhancer. Making this rasam is very easy. Every day I make rasam using rasam powder. But sometimes for a change I make this. Though it is not a special dish, but we love it so we enjoy it. My husband loves it very much, whenever we have heavy lunch he prefers to have this rasam for dinner. So that it helps in easy digestion. 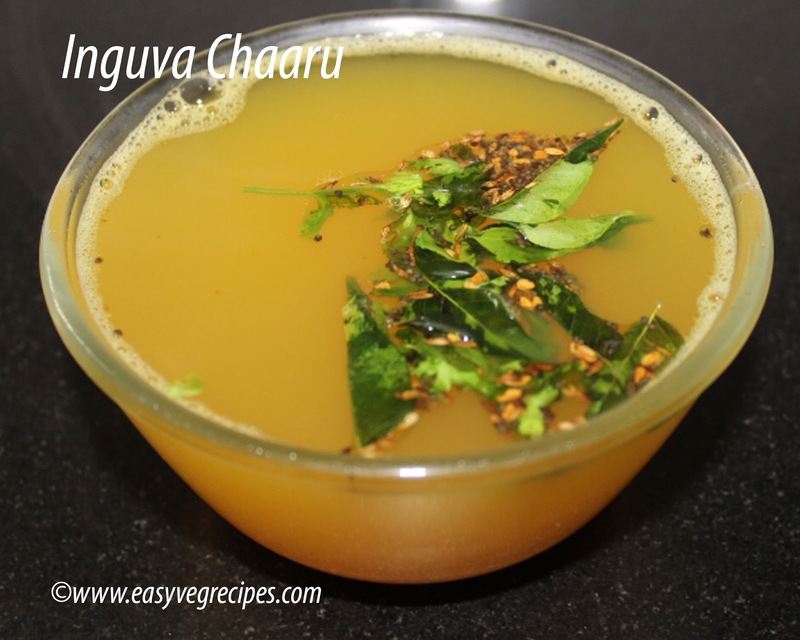 Inguva Chaaru -- Rasam with Asafoetida as the main ingredient. Soak tamarind for half an hour and squeeze the pulp. Add 2 cups of water to it. Add cooked toor dal and green chilli(make it two or three pieces). Mix it well and allow this to boil for five minutes. So that the rawness of tamarind pulp goes off. Add asafoetida while the rasam boiling. Heat oil in a kadai, add mustard seeds, cumin seeds, fenugreek seeds and a pinch of asafoetida. When it starts spluttering add curry leaves and coriander leaves. Add the tadka to the above boiling rasam and switch off. So simple it is right!! Serve hot inguva chaaru with hot piping rice.